Welcome to my updated Beatles Collection of MIDI & MP3 sound bytes along with every album cover are for FREE for everyone's enjoyment. To download MIDI's or MP3's, simply visit each album by clicking on the cover below in the table. Please note that all sound bytes are converted using special software and make excellent ring tones as most songs are 30 secs in length and are of HQ sound. But if you download a few, please consider a small donation or purchase later. Donations can be made via PayPal banner shown below. All Vinyl record LP's shown here on this page were released in the United States from the years 1964-70 while the entire band of John Lennon, Paul McCartney, George Harrison and Ringo Star were together. I have also added a complete compilation page too which mostly focuses on other Beatles' LP's/CD's that were released in the United States after the band's breakup. And "LYRICS" of every song ever released by the band are now also included here on the NEW! 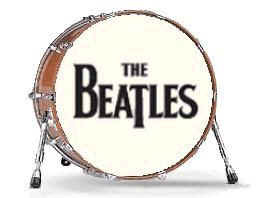 'BEATLES MIDI, MP3 Music & Lyrics Homepage'. Thanks for visiting and ENJOY ALL THE BEATLES MUSIC!!!! Choose any Beatles MP3 found on any of the original LP's from "Introducing The Beatles" in (1964) to "Let It Be" in (1970). Just type in the box to the left the name of the song you are interested in, then click on the button to finish the payment process. Song sent via your email. The Beatles' Albums Released In The USA After The Band's Breakup!